236 pages | 74 B/W Illus. The notion of data is increasingly encountered in spatial, creative and cultural studies. Big data and artificial intelligence are significantly influencing a number of disciplines. Processes, methods and vocabularies from sciences, architecture, arts are borrowed, discussed and tweaked, and new cross-disciplinary fields emerge. More and more, artists and designers are drawing on hard data to interpret the world and to create meaningful, sensuous environments. Architects are using neurophysiological data to improve their understanding of people’s experiences in built spaces. Different disciplines collaborate with scientists to visualise data in different and creative ways, revealing new connections, interpretations and readings. This often demonstrates a genuine desire to comprehend human behaviour and experience and to – possibly – inform design processes accordingly. At the same time, this opens up questions as to why this desire and curiosity is emerging now, how it relates to recent technological advances and how it converses with the cultural, philosophical and methodological context of the disciplines with which it engages. Questions are also raised as to how the use of data and data-informed methods may serve, support, promote and/or challenge political agendas. 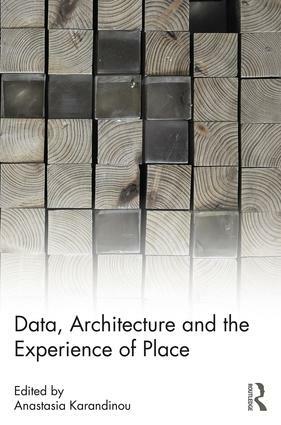 Data, Architecture and the Experience of Place provides an overview of new approaches on this significant subject and is ideal for students and researchers in digital architecture, architectural theory, design, digital media, sensory studies and related fields. Anastasia Karandinou is an architect and senior lecturer at the University of East London in the area of Architecture and Design. She has taught at the University of Portsmouth and at the University of Edinburgh and conducted research in the areas of architectural design, urbanism, digital media, interactive design, architecture and neuroscience. She represented Greece in the 11th Venice Biennale of Architecture as the main curator/ architect of the 'Athens by Sound' project, exploring the non-visual aspects of architecture. She recently co-led the ‘Cities in Transition’ project, funded by the British Council Newton grant, examining the political and social role of public space in cities of rapidly changing demographics.